Strain JSM 078169T (= DSM 21076 = KCTC 22279 = CCTCC AB 208031) is the type strain of the species Halomonas zhanjiangensis , one out of 84 species with a validly published name in the genus Halomonas , family Halomonadaceae . 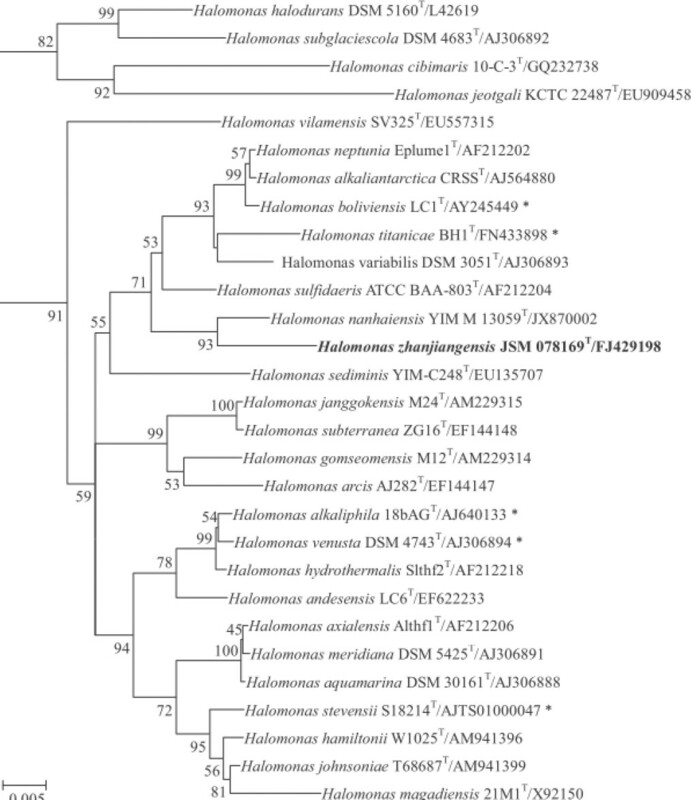 The family Halomonadaceae currently comprises thirteen genera (Aidingimonas, Carnimonas, Chromohalobacter, Cobetia, Halomonas, Halotalea, Halovibrio, Kushneria, Marinospirillum, Modicisalibacter, Candidtus Portiera, Salinicola and Zymobacter) with Halomonas being the largest genus in this family [3–6]. Members of the genus Halomonas have been isolated from various saline environments and showed halophilic characteristics [7–11]. Strain JSM 078169T was originally isolated from a sea urchin (Hemicentrotus pulcherrimus) that was collected from the South China Sea. The genus name was derived from the Greek words ‘halos’ meaning ‘salt’ and ‘monas’ meaning ‘monad’, yielding the Neo-Latin word ‘halomonas’ ; the species epithet was derived from Latin word ‘zhanjiangensis’, of Zhanjiang, a city in China near where the sample was collected . Strain JSM 078169T was found to assimilate several mono- and disaccharides and to produce numerous acid and alkaline phosphatases, leucine arylamidase, naphthol-ASBI-phosphohydrolase and valine arylamidase . There are no PubMed records that document the use of these strain for any biotechnological studies; only comparative analyses performed for the description of later members of the genus Halomonas are recorded. However, the NamesforLife  database reports at least 70 patents in which Halomonas ssp. are referenced. Here we present a summary classification and a set of feature for H. zhanjiangensis JSM 078169T, together with the description of the genomic sequencing and annotation of DSM 21076. H. zhanjiangensis JSM 078169T is a Gram-negative-staining, non-sporulating, strictly aerobic (Table 1), catalase-positive, oxidase-negative and slightly halophilic bacterium that reduces nitrate . Cells of JSM 078169T are short rods (0.4–0.7 µm × 0.6–1.0 µm) and motile with peritrichous flagella (not visible in Figure 2). Colonies are yellow-pigmented, flat and non-translucent with glistening surfaces and circular/slightly irregular margins, 2–3 mm in diameter after incubation on Marine Agar (MA) at 28 °C for 3–5 days. No diffusible pigments are produced. Growth occurs at 4–40 °C with an optimum growth at 25–30 °C, at pH range of 6.0–10.5 with an optimum pH of 7.5. The salinity range suitable for growth was 1.0–20.0% (w/v) total salts with an optimum between 3.0–5.0% (w/v) total salts. No growth occurs in the absence of NaCl or with NaCl as the sole salt. Strain JSM 078169T grows on Marine Agar and the medium contained the following: 5.0 g peptone, 1.0 g yeast extract, 0.1 g ferric citrate, 19.45 g NaCl, 8.8 g MgCl2, 3.24 g Na2SO4, 1.8 g CaCl2, 0.55 g KCl, 0.16 g NaHCO3, 0.08 g KBr, 0.034 g SrCl2, 0.022 g H3BO3, 0.004 g sodium silicate, 0.0024 g sodium fluoride, 0.0016 g ammonium nitrate, 0008 g disodium phosphate and 15 g agar. The predominant respiratory quinone is Q-9 which is consistent to the other members of the genus Halomonas . The predominant fatty acids are C18:1 ω 7 c (48.9%), C16:0 (17.0%) and C12:0 3-OH (10.7%). The profile of major fatty acids is also similar to the other representatives of the genus Halomonas [38–41]. H. zhanjiangensis JSM 078169T, DSM 21076, was grown in DSMZ medium 1510 (modified medium 514 for Halomonas sp.) at 28 °C. DNA was isolated from 0.5–1.0 g of cell paste using MasterPure Gram-positive DNA purification kit (Epicentre MGP04100) following the standard protocol as recommended by the manufacturer with modification st/DL for cell lysis as described by Wu et al. . DNA is available through the DNA Bank Network . The draft genome sequence was generated using the Illumina technology . An Illumina Standard shotgun library was constructed and sequenced using the Illumina HiSeq 2000 platform which generated 15,593,002 reads totaling 2,339.0 Mbp. All general aspects of library construction and sequencing performed at the JGI can be found at . All raw Illumina sequence data was passed through DUK, a filtering program developed at JGI, which removes known Illumina sequencing and library preparation artifacts . Following steps were then performed for assembly: (1) filtered Illumina reads were assembled using Velvet , (2) 1–3 kbp simulated paired end reads were created from Velvet contigs using wgsim , (3) Illumina reads were assembled with simulated read pairs using Allpaths-LG . Parameters for assembly steps were: 1) Velvet (velveth: 63 –shortPaired and velvetg: –very clean yes –export-Filtered yes –min contig lgth 500 –scaffolding no –cov cutoff 10) 2) wgsim (–e 0 –1 100 –2 100 –r 0 –R 0 –X 0) 3) Allpaths-LG (PrepareAllpathsInputs: PHRED 64=1 PLOIDY=1 FRAG COVERAGE=125 JUMP COVERAGE=25 LONG JUMP COV=50, RunAllpathsLG: THREADS=8 RUN=std shredpairs TARGETS=standard VAPI WARN ONLY=True OVERWRITE=True). The final draft assembly contained 18 contigs in 17 scaffolds. The total size of the genome is 4.1 Mbp and the final assembly is based on 501.3 Mbp of Illumina data, which provides an average 123.5 × coverage of the genome. 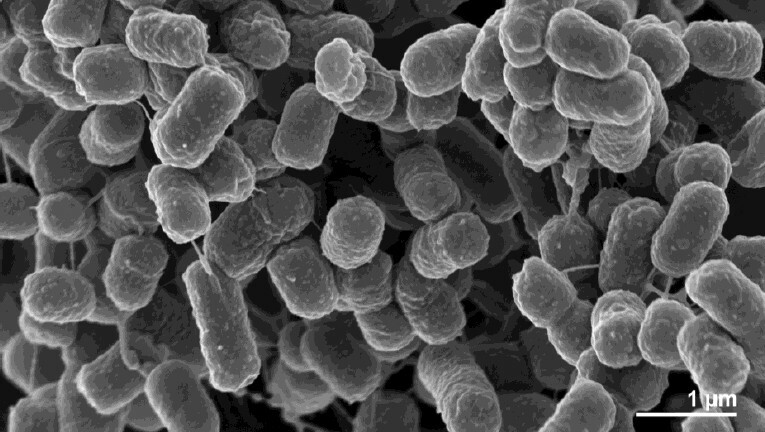 One complete genome sequence from a type strain of the family Halomonas - H. elongata  is available in GenBank, and four other permanent draft genomes of H. anticariensis, H. lutea, H. jeotgali and H. halocynthiae are available from IMG. The genome size of H. zhanjiangensis is smaller than those of H. elongata, H. lutea and H. anticariensis (4.06–5.02 Mbp), but much larger than those of H. jeotgali and H. halocynthiae (2.85–2.88 Mbp). Using the genome-to-genome distance calculator [59–61] version 2.0 revealed that all digital DNA-DNA hybridization (DDH) values are much lower than 70% using the program NCBI-BLAST, which demonstrated that H. zhanjiangensis is distinct from H. elongata, H. anticariensis, H. lutea, H. jeotgali and H. halocynthiae at the species level. Distance is 0.1845 between the type strain genomes of H. zhanjiangensis and H. elongata, which corresponds to a DDH value of 13.00 ± 2.99%. The distances of H. zhanjiangensis from H. anticariensis, H. lutea, H. jeotgali and H. halocynthiae are 0.1842, 0.1837, 0.1835 and 01849, which correspond to DDH values of 20.30 ±2.41%, 20.30 ±2.41%, 20.40 ±2.41% and 20.20 ±2.41%, respectively.